Update from Sarah Jane, September 14, 2018: So McConnell announced that hearings on Kavanaugh will happen Thursday, September 20. Both of them. The full floor vote will follow the Judiciary Committee vote almost directly. We also got word that Senator Dianne Feinstein passed a complaint about Kavanaugh to the FBI. Because the individual involved asked for confidentiality, there’s not much we can know for sure about the complaint itself. While her Democratic colleagues on the Judiciary Committee urged her to give it to the FBI, the agency is apparently not going to investigate, and has handed it to the White House for inclusion in Kavanaugh’s file. The larger point: The door is not closed yet. 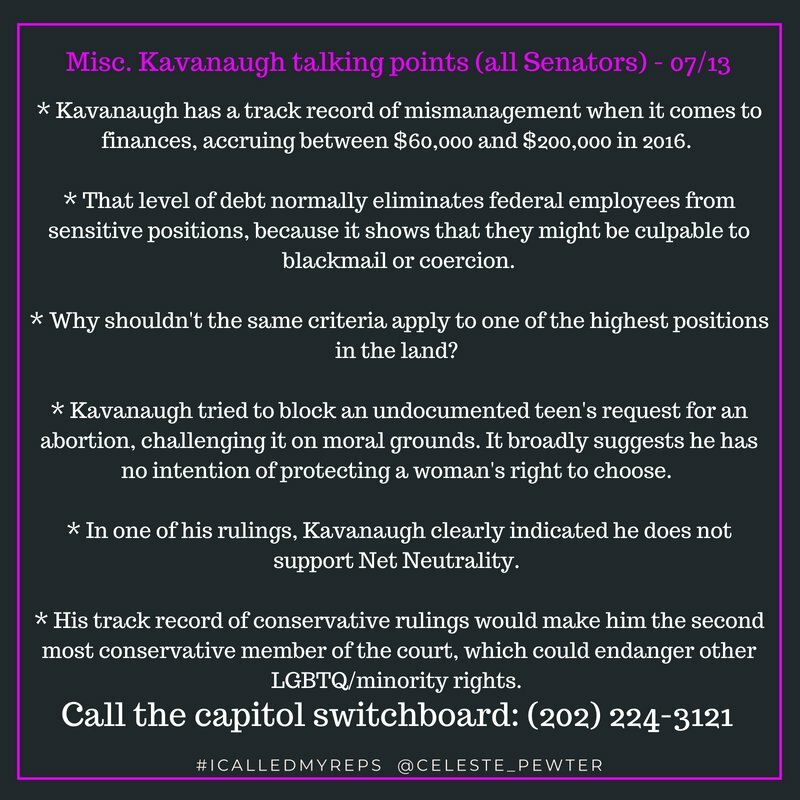 Please call and keep calling, no matter if your Senators are pro-Kavanaugh, anti-Kavanaugh, or undecided (but especially if they’re undecided, and especially if they’re members of the Judiciary Committee). Keep calling and leaving voicemail messages through the weekend, too.